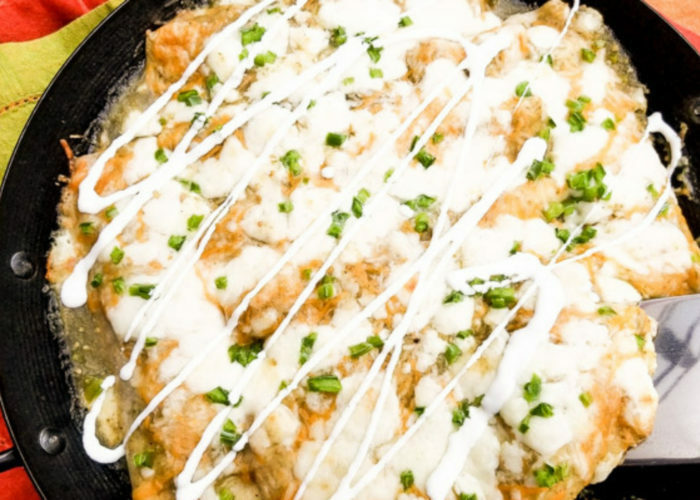 For a delicious comfort meal or appetizer, you won't want to miss out on these creamy cheesy beef enchiladas in green sauce. They're made with corn or flour tortillas, perfectly seasoned ground beef, black beans and smothered in a delicious green sauce/salsa verde. Yummy! Lets talk about enchiladas! How about these here beef enchiladas, to be exact! 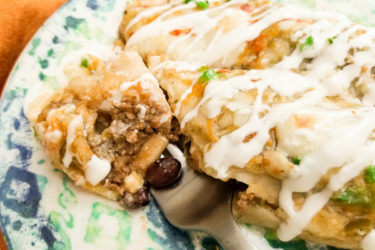 I know they may not look the prettiest but these cheesy beef enchiladas in green sauce are just the perfect comfort food appetizer or meal. Enchilada recipes are a dish I believe we can all relate to in one way or another. 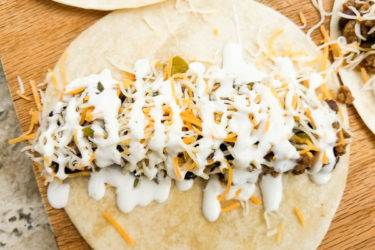 Whether you use ground beef, shredded beef, chicken or shrimp, they are all amazing when wrapped within a warm tortilla and then topped with gooey melted cheese and a delicious savory sauce. Enchiladas date back to Mayan times, maybe longer. 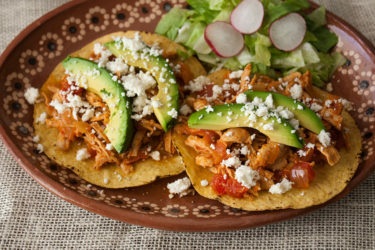 Tortillas were wrapped around different foods, such as fish and a variety of meats. The same way there are a variety of enchiladas, there are also a variety of enchilada sauces. These are just a few of the amazing enchilada sauces that cover and smother your already delicious savory enchilada. And this here enchilada beef recipe coming straight to you is... yes, you guessed it! “Enchiladas verdes,” or enchiladas in green sauce! Now I've often said that I’m not a lover or fan of ground beef, but done right and seasoned right, it’s perfect for me too! Add onions, black beans, bell pepper, jalapeño, and spices to the ground beef, and it slowly becomes magical. Then add green sauce/salsa verde to the ground beef and cheese, and you've just created one of the best concoctions of ground beef you can imagine. Take them out of the oven and top with crema Mexicana, queso fresco and chopped fresh cilantro, and you may have just fallen into heavenly bliss. Remove husks from tomatillos. Rinse. 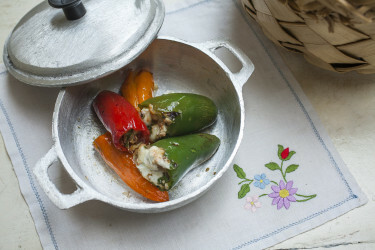 Place tomatillos, onion, garlic and serrano pepper on a roasting pan. Roast for 15-20 minutes in the oven at 400º F or on the stove for 10-12 minutes. After removing stem from the serrano pepper, add all ingredients to a chopper or blender. Pulse. Add cilantro and pulse again. Add salt and pepper to taste. Note: You can add a bit of water (a couple of tablespoons is good) if you would want to make the salsa a little thinner. Add the bell pepper, onions, jalapeños and black beans. Mix well and cook for 5 minutes. Add about 1/2 cup of salsa verde to the mixture and cook for another 2 minutes. Add garlic and spices. Cook for another 5 minutes. Note: I also like to add about 1/3 cup of fresh chopped cilantro to the mixture but this is totally optional... I really like the flavor. Take one tortilla at a time and fill with ground beef mixture in center. Repeat with all other tortillas and top each with cheese. Roll tortilla snuggly and place in a casserole or baking dish with seam side down. Top all tortillas with more cheese and pour salsa verde over them. 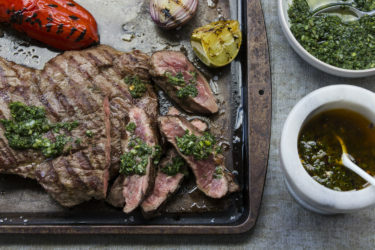 Note: You may need to spray your pan with nonstick spray if you are using a nonstick baking pan, or dab vegetable oil along pan with a napkin. Bake at 350º F for 20 minutes or broil until golden brown and bubbly. Top with chopped cilantro, drizzled crema Mexicana or sour cream, and crumbled queso fresco. Serve immediately.